sacred energies to be shared. this knowing is dedicated to bhairava sekar swamy. 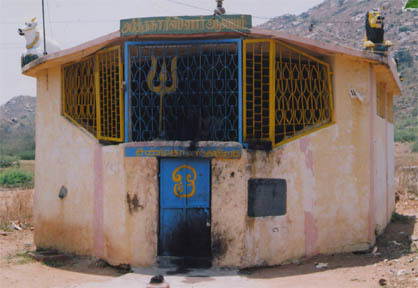 the above picture is one of the many power spots of thiruvannamalai for you (above)- inside this eye sore enclosure is the temple of ardhanadeswara, lord siva and goddess sakthi as one, the male and female principle in oneness. ardhanareswara is cosmic union our consciousness has transcended to in the third eye awakened. mother kundalini uniting above in the third eye with the state beyond the mind, lord siva forms the sacred trinity with the third eye being the cosmic witness that we are. in this sacred union is manifestation where thought is reality. in this awareness is also the doorway that transcends threshold of limits on time, space and matter. when in person in thiruvannamalai, meditate before this sacred sacred spot- even as you feel our ancient father, annamalayar , the sacred mountain as the background behind holding us as a baby in our breath’s surrender. “who am i” is a sacred inner inhale, breath in clockwise reaching to be the awakened muladhara fire. “i am” is being the eternal ever youthful yogi, lord siva, the spirit, the holy ghost, the true dweller. “all is” is the third eye, the spirit that is oneness in being aware. the male and female principle in harmony within as being one, whole and complete. we have come to fulfill buddha’s karma. we are ariven, the awake. as the eternal lamp of the awakened, aum as sound in external experience and as sacred resonance in the inner experience alights the primal oneness. in this oneness, intellect has merged into the wisdom of simply being. each thought from source as in the knowing. in the ascended fire of our ancient yoga is the ultimate asana, between the third eye. seated here in the tranquil sacred ‘breath’ of mantra that has merged breath to breathlessness. in the conscious retention with the guided exhale arises the spirit as witness giving birth to thought and cradling the body. gross form is transcended. we are the subtle radiant being. – brought to these words by suresh ramsait and tapasyogi adiyen nandhi.